I took this picture last weekend and I’ve since finished a fourth fifth repeat, but this is basically how it looks now. If you’ve been following the comments on the previous entry you know that I frogged the entire original stole and re-knit it on bigger needles. For some reason I didn’t think to, y’know, check the ball band on the Kidsilk Haze when I bought it, and randomly decided to knit on US 1s, for really no good reason at all. Now I’m knitting it on US 4s, thanks to a prod from poster Calamintha at Knitter’s Review and everyone is much happier for it. I had to alter the pattern a bit after deciding to change needle sizes. The friend that this is intended for is quite petite, and would drown in the huge stole that would have resulted if I had continued to knit the pattern to specification. So one night, in a fit of stress-induced insomnia, I sat down and crunched the numbers. I lopped off one of the horizontal repeats and 8-10 of the vertical repeats, which I think will yield the approximately 18″ x 60+” stole I was originally aiming for, once the edging has been added. In other knitting news, Fred has been adopted by a very adorable girl who just turned a whole one year old. I think she’ll be able to show Fred a better time than my coffee table. Plus then Fred can hang out with the giant Bobbi Bear I made for her a year a go. The giant Bobbi Bear was, for the first few weeks of her life, significantly bigger than its newborn owner. Granted, that was the whole point. Hehehehe. I’ve also cast on for my first pair of socks, ever! 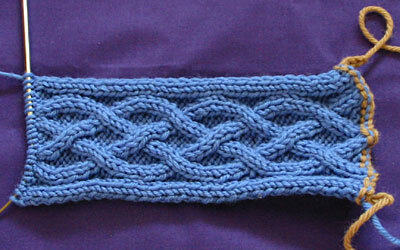 I figured I’d start with this pattern, since I have no desire to knit socks on dpns, ever. Plus I suffer terribly from Second Anything Syndrome, so if I ever have to knit two identical somethings, I have to knit them both at once. I’ve finished the leg portion and I’m trying to figure out what I want to do with the heel. I think I may skip the slipped stitches and do the heel flap in plain stockinette, since I don’t really like how the slipped stitches look. 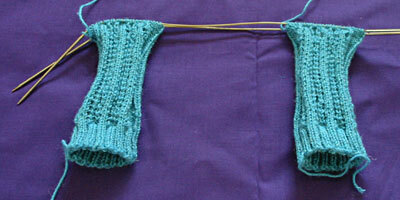 I’d also like to try a short row heel since it seems so much less fiddly, but I think I’ll save that for my next pair. I figure I should do the flap-and-gusset heel at least once, right? I can see why sock knitting is so addictive. It’s such a small and portable project, and almost any 5- or 10-minute break in the day, whether it be waiting at the bus stop or waiting for a meeting to start, is sufficient to knock off a couple rounds. Plus, you can never have too many pairs of neat-looking socks! I do have a general complaint about sock patterns, mainly because I am not a fan of variegated yarns. I think the colors look lovely in a hank or a skein, and they’ve seduced me into buying my fair share of variegated yarns, but too often the colors just turn to mush when they’ve been knit up. And given that your eye is more easily drawn to high-color contrast than to texture patterning (one of my friends used to do research in low-level visual processing and he’d insert a 45-minute explanation of why this is right here), using a variegated yarn can easily obliterate any cable or opework detail in the pattern. Anyways, I just wish more sock patterns that are written for a variegated yarn would also have a photo for a solid-color yarn, like Falling Leaves on Knitty. I spent a lot of time squinting at the Straight-Laced Socks pattern trying to figure out what the lace pattern actually was. 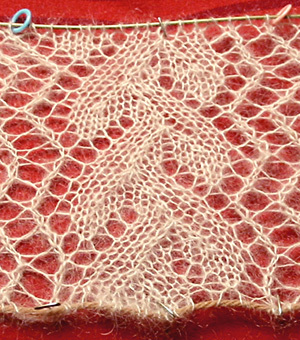 Speaking of which, if you’re knitting these socks and want each lace repeat to be symmetric, you need to change the first k2tog in the lace pattern to a ssk. I don’t think it’s a mistake in the pattern, but I opted to change it since I preferred the symmetry over the way the pattern looks as written. And finally, a Quinn update. Quinn #2 is chugging along, and I think the modifications I made to my original design will make the knitting go more smoothly. I’ll write up the pattern for the bag…soon, I hope. Quinn #1 requires some surgery. One of the seams holding the lining to the bag popped and requires re-sewing. The knitting itself is holding up well, minus the crazy-pilling tendencies of the Cascade 220 Superwash. CogKnition posted this on May 28th, 2006 @ 3:54pm in Unfinished Objects | Permalink to "A Bit More"
Print o’ the wave looks gorgeous—definitely better on the bigger needles!